This guest post is brought to you by BoostSuite, the easiest way to build more website traffic and get more marketing conversions. The competition is fierce, which means you must be relentless with your efforts. You need to research and find keywords in order to find content opportunities, write and optimize high-quality articles, test your content to determine what works best, and promote your business using social media and email. Phew! That’s one heck of a to-do list! With so many tools on the market today, it can be difficult to sift through them, determine the pros and cons of each, then decide which to add to your toolbox, all while maintaining your regular day-to-day work responsibilities. Now for the good news. I’ll help you save time and effort by sharing with you 5 tools you can use to improve your internet marketing results, without breaking your bank. The first and most important component of your internet marketing strategy is keyword research. That’s where WordTracker comes in. You can sign up for a 7 day free trial and get started researching your competition and uncovering your most valuable keywords. Be sure to start a master spreadsheet of valuable keywords that you can use for content marketing purposes in the future. After you start publishing more valuable content to your website, as long as you have online forms, a shopping cart, or other conversion points on your site, you’ll start to see results in the form of leads and/or customers. And that’s great! You may notice in your site analytics that some pages on your site convert visitors into leads or customers better than others. You can use Optimizely to leverage that information and fix the bottlenecks. This tool allows you to test calls-to-action, buttons and headlines to determine which versions convert your visitors into leads/customers the best. You can sign up for a free 30 day trial and get started today. This is your go-to, all-in-one website marketing tool. It shows you a single easy-to-understand letter grade at all times so you always know where your website optimization progress stands. This tool automatically discover new keywords from your search engine visitors and automatically determines their opportunity levels (based on search volume and competition levels). It then automatically assigns your top opportunity keywords to your existing website pages where they will have the most impact (based on similar content on those pages). This saves hours of time each month compared to doing this manually. BoostSuite then constantly scans all pages of your website looking for violations of search engine guidelines. It brings those violations to your attention in the application and twice weekly via email when issues are found. Just like with Optimizely, BoostSuite automatically finds your worst bottleneck pages and allows you to instantly run Headline A/B tests with your real website visitors to determine what content is most effective at turning visitors into new customers. When a winning headline is found it is automatically served to all visitors and your website instantly starts receiving more marketing conversions. Sign-up for a free 14-day trial today. After you publish your valuable content online, you must promote it through your social media channels so your target audience can read it and share it with their followers. This creates the viral effect you’re looking for. It also creates inbound links that are important to your website’s search engine optimization. Instead of doing one-off posts in Twitter, Facebook, Google+ and LinkedIn, try using HootSuite instead. It allows you to manage multiple social networks, schedule posts in advance, track mentions of your brand and analyze your traffic to provide valuable insights. You can sign up for a free account with them now. Another great way to keep in touch with your customers, prospects, and readers alike is with email marketing. 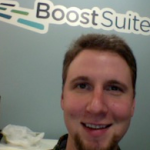 It’s not a customer acquisition tool like BoostSuite, but more of a customer retention tool. Using MailChimp, you can easily create your own email template and send mass emails out to your subscribers regarding product improvements, new features, promotions, sales and other company news. If you have less than 2,000 subscribers and send less than 12,000 emails a month, then you can sign up and use MailChimp for free! Do you have any experience using these tools or any other internet marketing tools? Was it good or bad? Why? Let’s hear about it in the comments below!